Honestly I didn’t want to write the review until I read them all together in one sitting because honestly reading this first part by itself doesn’t want to make me read more based on the characters not the plot. The main character is a bit… ummm… flat… something is missing. Only reason I am reviewing it right now is because I get 17 (or more) notifications a day that people are recommending I read this part and now a review of it (Some event on facebook going on)So I read it… I am done for now reading the books, until I have time to devote to reading the whole thing. But on part one alone… It moved quickly and it has an enjoyable plot… the characters I don’t really care about, and that is why I am giving it a 3 star rating I liked the direction this is going, and am hoping that in the next 5 parts the characters develop a bit more for me. I liked it… I will read more… but I am in no rush to do so… 3 stars… I liked it… my rating is 1 star- poor tree 2 star- hated it 3 star liked it 4 star- loved it 5 star- OMG BEST THING EVER. I didn’t hate it, but I didn’t love either. It may be better once I read all 6 parts together. Now I know people who love this and will give it 5 stars and 4 stars and hate my little 3 star rating, but to be honest it takes more than few pages to get into a book for me, this was really just a few pages takes like 5 minutes to read and to have to go out and buy other parts of the book… Not really for me, however that being said, as I said the plot I believe is there, and it interests me enough to want to continue (at some time) and finish this ‘serial’ novel. Synopsis: One moment of love, forever changes Dani. She just was going to throw her sister, Malika, off at home. She never thought there was a whole other world out there, until she joins it. To protect her sister she gave her life. She was killed. She died. She was changed, by a creature she thought of as fiction. She is dead. Well, undead. But she does not thirst for mortal blood. As a gift the powers that be, for her unselfish love, they changed her thirst. She hungers for vampire blood, the blood of evil…. and she will hunt them and destroy them with every fiber of her undead being… Before the Vampire Elite destroys the very reason Dani still maintains her soul… Mialika… The daughter of a Virtue… and an Archangel… Dani must save her sister and the other children of the Angels to prevent the end of the world… In death she discovers the secrets of the past. In death she discovers her purpose in life. And in death she shall live! “Who are you?” Dani asked the man that stood above the grave… stood above her grave. “I am the darkness, that has invaded your soul.” The being responded. Cover: OH WAIT!!!! You can’t see that yet! Look out I will have a cover reveal on Bex N’ Books Blog (Click Here) sometime in November! I will let you know when! This book is a must read! It should be in high schools. This book is just wow! I don’t even know where to start! I love the characters, Alex and Julia are easy to love and their story is makes this a great YA Novel! I am not a big fan of YA never have been, thought I have started reading more and more of it lately. This book I would recommend to everybody! I am normally really hard on YA books because of the situations they show, but is is real stuff, and shows YA as it should be shown. 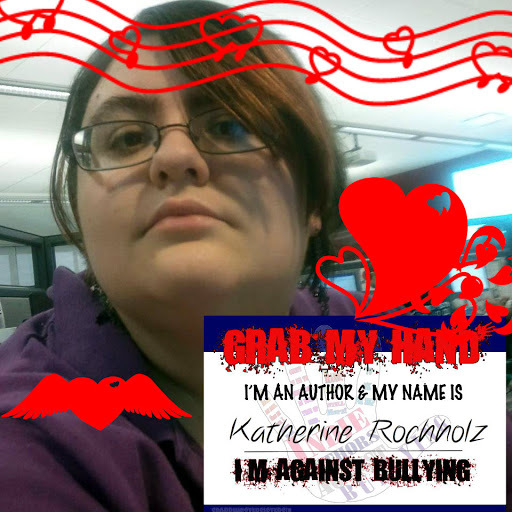 Bullying is an issue that everybody faces, I myself have been a victim and it has made a lasting negitive effect on my life, and this book brings the topic to public view in away that allows people to understand it. 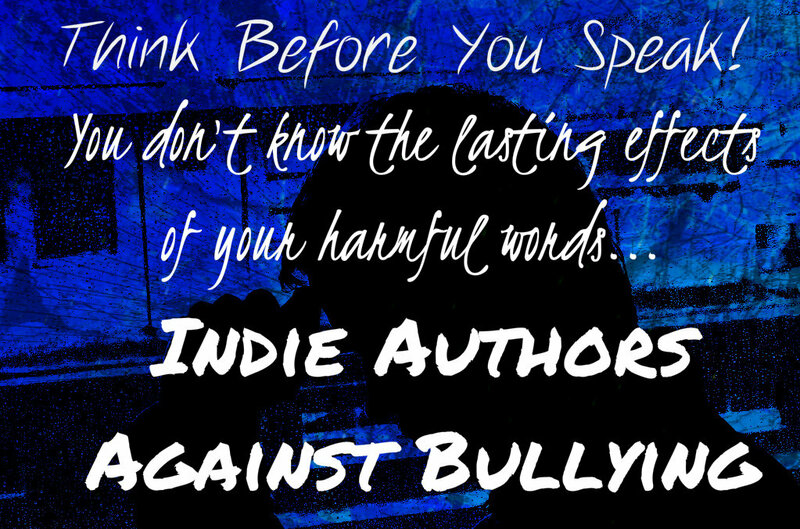 If you have never been a victim of bullying you wouldn’t understand, and normally when bullying is the topic of the book those who were the bullies or those who have never been bullied don’t really get the picture and see it is a pure work of fiction. This book though a work of fiction allows you to get inside the head of those that are hurt by bullying and you see the effect it has on Julia. This is a fantastic book and a must read for anybody ages 12 to 112! A blog has set up Grab My Hand! It is a stand against Bullying and I fully support it! Sparring Stepsisters! is the website, just print out the one of the certificates sign you name put your hand to the photo and pledge! If you can’t print it don’t worry! Just take a photo of you and put the image of the certificate on it and electronically sign your name!!! It doesn’t matter how you do it! Just that you do it! I DID! 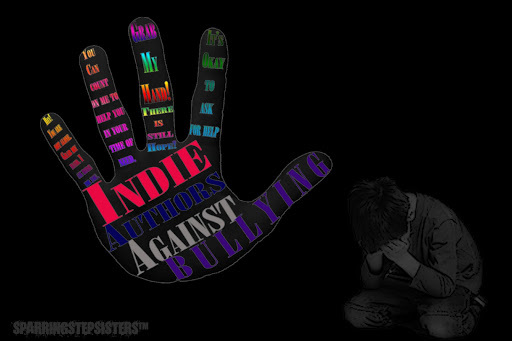 This is a way for authors (they have said Indie authors but you know what you traditional authors you should pledge too! 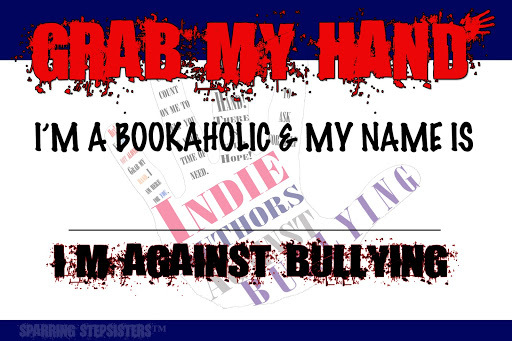 ), bloggers, and bookaholics to unite against bullying. Bullying is ALWAYS an issue. I for one am pleased that people are finally standing up together, and telling people, ‘You know what? 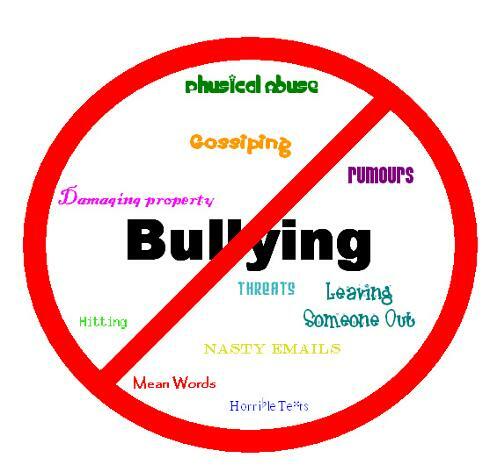 Bullying is wrong!” Think before you speak!!! You never know the lasting effects of your harmful words!!! The other day I shared my story on bullying! 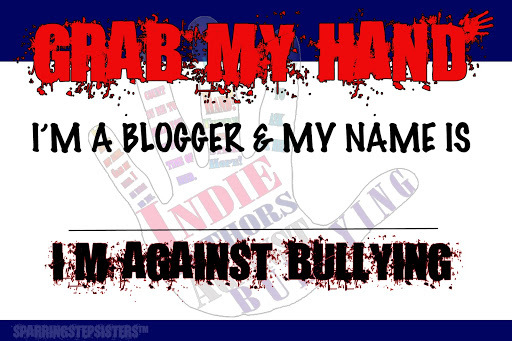 You can read it here on the blog ( click here Bullying). This campaign is sponsored by the ladies of Sparring Stepsisters (click their name to go to their site! ), and is being done with the hope of letting anyone out there who’s being bullied know that they are not alone, I know that when I was being bullied, I felt so alone. I thought nobody cared. And back then few did, but I know better now. That being said, I still live with the lasting effects of those words, those actions, taken by other people ( I say people because bullying just isn’t done by kids!) But I want people to know that people do care, they do understand what they are going though! If anybody ever needs to just talk I am always around! I don’t care if it morning noon or night! 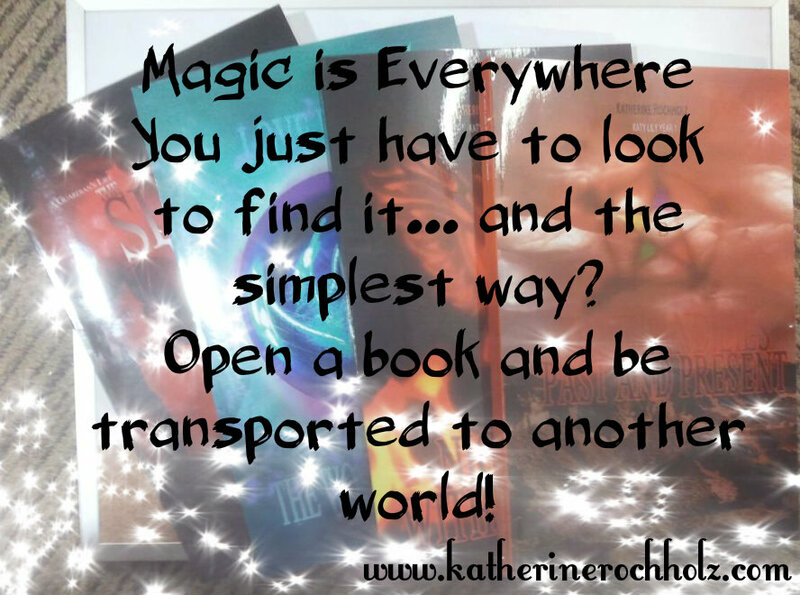 Send me a message on facebook Katherine Rochholz (Just click my name!) 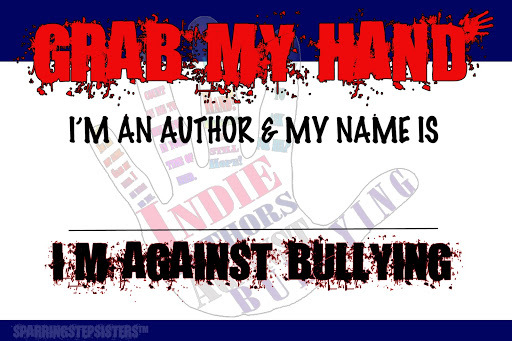 It is time to speak up against bullying and make a stand against it!!!! Now thanks to the Sparring Stepsisters here are the images!!! Take the pledge! I did and I hope you do as well!!! PLEASE TAKE THE STAND AGAINST BULLYING!!!! Frank looked at the clock and knew it was time to prepare for the day. He put his journal away; he placed it in his drawer on top of his father’s journals; the ones that had all the notes that caused Frank’s existence. He slammed the door a little hard, and locked the drawer. He looked in the mirror his skin had a light green tint; but it was nothing a bit of make-up could not hide. He had gotten very good at hiding the color of his skin. It took a lot more time to hide his stitching, but he had taken to wear long sleeve shirts and pants no matter the temp; after all he was room temperature. He was dead. With no circulating blood. No soul. He didn’t have to hide his bolts to much anymore, thankfully strange and exotic piercings are popular during this time, and most people see them as a piercing. They always asked if his favorite book is Frankenstein. Frank hated that book. It made his father and himself as a monster. Well, that night they were, when they killed his father. He killed the village. Mary Shelly was the only survivor. She wrote their story. He should have killed her. But she was a young child. He couldn’t bring himself to kill the child. He looked at the note that Cameron had left for him. Something about picking up milk for some meal he wanted made tonight. Well, Cameron can cook for himself. The boy king got on Frank’s nerves. But, he would be lost with him, Lucas, and Drake. They all met a few hundred years ago. Well, he first met Cameron. He used to be Tutankhamen. Frank had been wondering around Europe looking for a place to live, when he ran in to him. He took pity on the monster and invited him to stay with him. Frank didn’t know what pride was then and jumped at the chance. He barely could speak at the time. However with Cameron’s help he became highly educated. Education… their path to living in mainstream America… moving here may not have been the best idea. Many people are too curious about new comers, but on a college campus the majority of people are new, so it was easy to come up with a generic story to tell them about where they were from. Frank looked at himself in the mirror, his green skin now covered, and he was set to go about his day. But he was still upset… as he was every morning… but before he could be buried in his thoughts a thud brought back to life. He saw Tony’s truck outside, and remember that Drake had a party last night. Frank found it easy, too easy, to turn a blind side to Drake’s parties. But what do you expect from a soulless creature? Frank stood up and grabbed his books, took one last look in the mirror and left. Here is the picture I made, please feel free to share it!